The Daewoo KOR8A0R is a 23 litre solo microwave oven finished in black, offering 800 watts of power and a built in autocook menu. Read on for our Daewoo KOR8A0R review. Finished in a gloss black exterior, the Daewoo KOR8A0R offers a medium sized capacity and 800w of power, for a relatively inexpensive price tag of around £60. Despite it's modest price tag, it looks stylish - Daewoo have put thought into the appearance of this appliance, and it certainly shows. The sleek black casing of the Daewoo KOR8A0R has the look and feel of a more expensive appliance, and as a whole it impressed our test team. The controls are very well labelled with text, and not symbols, which meant that we were able to operate the KOR8A0R microwave straight out of the box, and without having to resort to the instruction manual. If you sometime struggle with technology, then the KOR8A0R microwave oven will be ideal for you, with simple settings for each operation and a clear and easy to read display located on the top right of the appliance. This black microwave features a dual wave system, including an integrated auto cook menu. Ten different power settings provide enough options for the vast majority of users - please note that as it's a solo microwave, it doesn't feature a grill or regular oven facility. It is family friendly - and includes a child lock function to prevent little hands from causing accidents. Also built into the Daewoo KOR8A0R is an impressive eco mode facility - after ten minutes of no use, the microwave shuts down into a power saving mode, thus using less electricity and thereby saving you money. Overall capacity is mid sized, providing a 23 litre volume, and the dual wave system ensures that your food is cooked evenly with no cold or uncooked spots. Put simply, the KOR8A0R model is a very functional cheap microwave at a competitive price - if you need a simple microwave oven for basic tasks such as cooking and heating, then this is ideal. The intuitive control system means it will be suitable for all users, even those who usually aren't too confident operating buttons and dials. The exterior of the 23 litre Daewoo KOR8A0R microwave oven measures 46.5cm by 27.9cm by 36.6cm, and in total the appliance weighs just 12.5kg, which is pretty light for a solo microwave of this size. So who is the KOR8A0R aimed at? Granted it's not the largest microwave on the market, but it is perfectly compact and very easy to setup and use thanks to the labeling next to the controls. Essentially it's a simple method of heating up and cooking food without fuss - what the KOR8A0R does, it does very well indeed. It's perfect for small to medium sized households and work places alike. 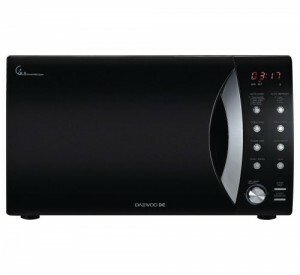 A low priced yet reliable and attractive Daewoo microwave - we simply can't fault the KOR8A0R for the price. The controls are simple to operate, and the build quality is good, especially considering the price tag. If you're after a cheap yet effective solo microwave, then the Daewoo KOR8A0R will be ideal for your needs. 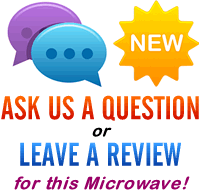 I like the look of this microwave, and the review sounds good, but can you tell me if food can be seen while cooking, as I recently purchased a Samsung that I had to return as the black door could not be seen through when in use.